I made a simple wreath for a fall packaging idea with the notion that the wreath could be removed from the bag and added to a card with no problem. To make the wreath I used the new Sprig punch # 148012 from left over scraps of cardstock. The sentiment is from Stampin Up’s Country Home #147678 stamp set. I love playing with paper and dressing up ordinary items and today is a fun gift bag that I dressed up using Stampin Up products. I used the Quilted Christmas DSP #144617 and then overlayed a piece of vellum and cut our the flowers from the Quilt Builder #144673 Framelits and the sentiment from the Mini Treat Bag #137547 framelits from Stampin Up. For my April workshop I used the retired Stampin Up Kraft bags to hold my workshop card kits. I tucked the cards in and sealed it with a piece of Washi Tape and made a cute seal using the adorable chick from the now retired SAB Honeycomb Happiness stampset. Finished b wrapping bakers twine and sentiment stamped on the Washi Tape punched piece. They were so cute and the workshop attendees squealed with delight! Todays post is the kit that each guest got at Cammie’s Butterfly Basics workshop last month. Each guest got a personalized bag with their name on it and all the materials to make the 5 workshop cards tucked inside. Cammie started with a Stampin Up Polka Dot Bag #135503 and then randomly used some of the white dots as flower centers to stamp flowers from the Stampin Up Butterfly Basics #137154. 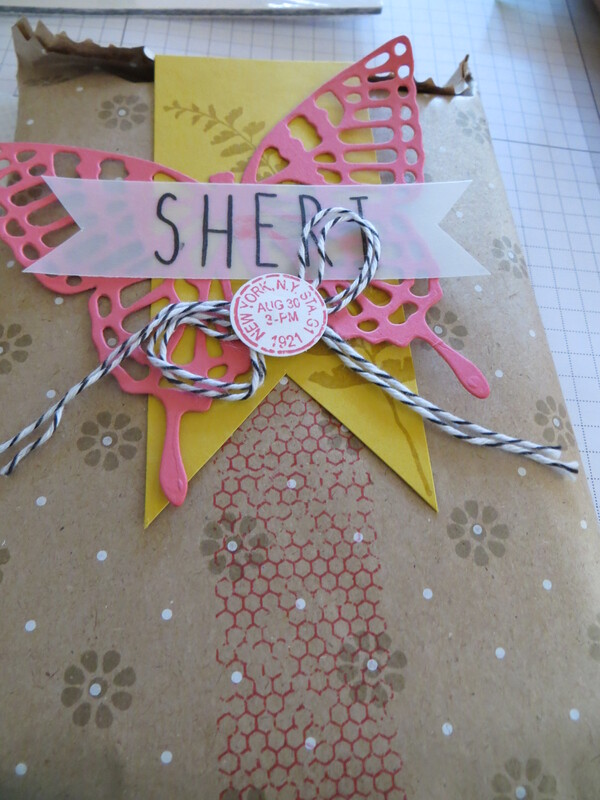 She added a banner stamped with the fern leaves from the Butterfly Basics. Cammie then cut the large butterfly from the coordinating Butterfly Thinlits Die #137360. A vellum banner with the first name of each guest stamped using the Skinny Mini photopolymer #133665 stamp set was layered on top of the butterfly. She then added the vintage postmark image and some black and white bakers twine to complete the adorable packaging that the customers just did not want to open because it was just so pretty. The Butterfly Basics stamp set and the Butterfly Thinlits are a Stampin Up Bundle and save 15% when purchased together with a single item number (wood #139322, clear#139323 and photopolymer #138865). The Butterfly Basics bundle is available thru June 2nd in the Stampin Up occasions catalog. Presentation is always part of the fun when prepping for a Stampin Up workshop. Today’s post is the packaging that Cammie is using for her Sept workshops. All the workshop supplies are packaged inside this cute Chevron Tag a Bag Gift Bags #131370. Cammie used a different piece of DSP and coordinating DSP for the large banner. 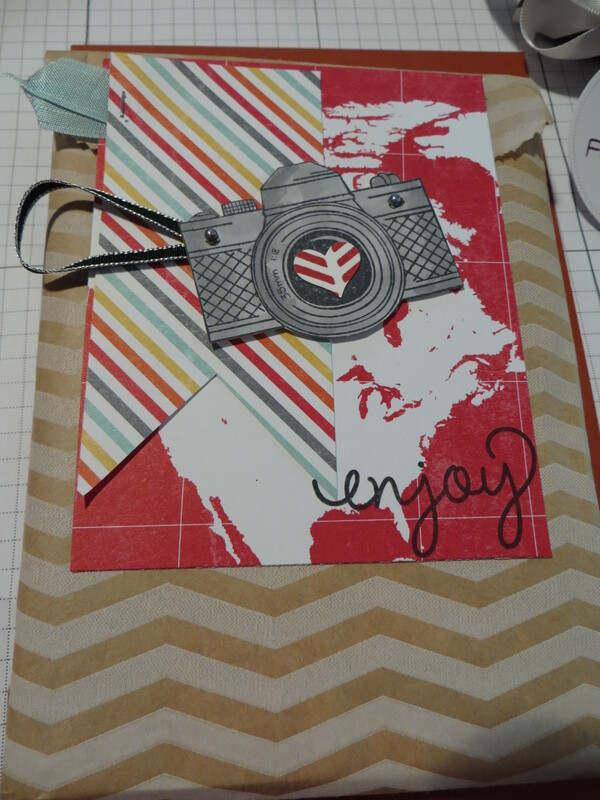 She used the Snapshot single stamp #133812 to create her camera accent complete with ribbon wrist strap.